I’m sure many restaurants are jealous of El Ventorillo’s superb location. 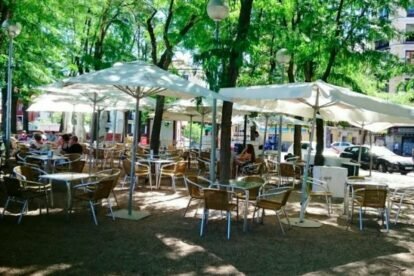 Right beside el viaducto de Segovia and at the top of the hill of las Vistillas, this is my favourite place to have a beer in all of Madrid, without a doubt. You sit under the mellow shadow of trees with a fresh breeze (hence the name), you watch la Catedral de la Almudena, the vast esplanade of Casa de Campo, and if you’re very lucky, you may see the mountains in the background. I can already feel it while writing this article. The place is surprisingly calm, even beside the busy street Bailen. El ventorrillo is so placid that waiters tend to wait sitting down if you need something. What El Ventorillo gains from its gorgeous location it loses from its pricey and standard food. Their speciality is Pollo al ajillo, chicken with a tint of garlic. The tapas here are basic and okayish, and I would avoid eating a menu del día. As its location is unique, the beer is more expensive than other bars, but it’s totally worth it. Sit and delight yourself with the same views the King of Spain has from his palace from your little kingdom.